the same reason, ginkgo seeds should be consumed in limited quantities to enjoy them safely as food. family of Ginkgoaceae, and is the only existing member of the genus, Gingko. It’s soft, yet chewy textured kernels are eaten either toasted or in dishes in the far East-Asian cuisine for their nutritional as well as medicinal properties. 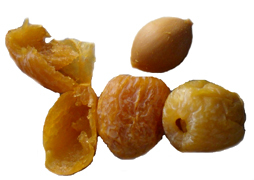 Ginkgo nut and fleshy fruit. trees exist independently. These days, they being planted as ornamental roadside trees as well as cultivated in the nurseries for their medicinal values of leaves. Ginkgo biloba foliage and fleshy fruit. situated in the center of the fruit. An edible ginkgo nut is actually a gametophyte surrounded by a thin membranous layer inside this hard shell as in pistachio. Ginkgo kernels measure about 1.5-2 cm in length and 1 cm in diameter and feature light jade green hue. Are Ginkgo nuts healthy? What science says? day and adults about ten per day. (Medical Disclaimer). etc. 100 g of fresh, raw ginkgo kernels compose of 182 calories. also believed to ease asthma, bronchitis, and urinary tract ailments. 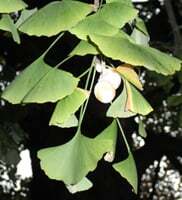 Overall, the ginkgo nuts may be used in small quantities as medicine instead as a staple food source unlike as in other edible nuts and seeds. When eaten in limited and specified amounts, ginkgo nuts would confer some of the health benefits. Ginkgo nuts compose small amounts of B-complex groups of vitamins such as riboflavin, niacin, thiamin, pantothenic acid, vitamin B-6, and folates. magnesium, zinc, and selenium. Copper is an essential trace mineral that is required for the neurotransmission, metabolism, as well as red blood cell (RBC) synthesis. 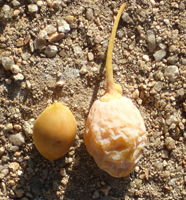 Ginkgo biloba fruit and seed. of an outer fleshy inedible pulp, like as in date fruit, known as sarcotesta. and respiratory functions. In the United States, FDA has not approved the use of ginkgo nuts as a food item or food additive. ginkgo can be readily available in the stores specializing in the sale of Far-East Asian food items. Fresh, unshelled nuts can be stored at room temperature for few a weeks; and inside freezer section of the home refrigerator for several months. turn rancid. 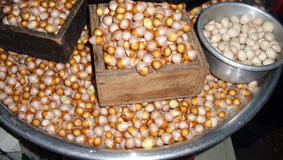 Shelled nuts, however, stay in good condition for a couple of days stored in the refrigerator. Raw fresh ginkgo nuts in a South Korean market. membrane enveloping around a single, jade-green edible ginkgo kernel inside. unique addition to savory egg custard known as chawanmushi. In the Korean Peninsula, the seeds being served during a marriage and traditional ceremonies. in the fruit pulp may cause severe dermatitis (similar to poison ivy) in some sensitive persons. (Medical Disclaimer). illustrations of their nutrition facts and health benefits. Ginkgo biloba by Teris A. van Beek- Laboratory of Organic Chemistry Wageningen Agricultural University, The Netherlands- PDF.